@FirstDateMovie Follow the making of the movie! Something fun and exciting is happening in our lives right now. My hubby is on the way to directing his first short and we are beyond thrilled. Casting is well underway, the puzzle pieces are beginning to fit and I thought it would be so cool to include my readers and followers in on this journey. Partnered with writer and producer Edrei Hutson, this is already looking like a promising project. Marshall and Michelle meet up for their first date and everything is going well, so well in fact that they decide to go back to her place, and that's when they both realize that things aren't always what they seem. This is First Date. Call backs are coming up soon and I want you all to see the fun. 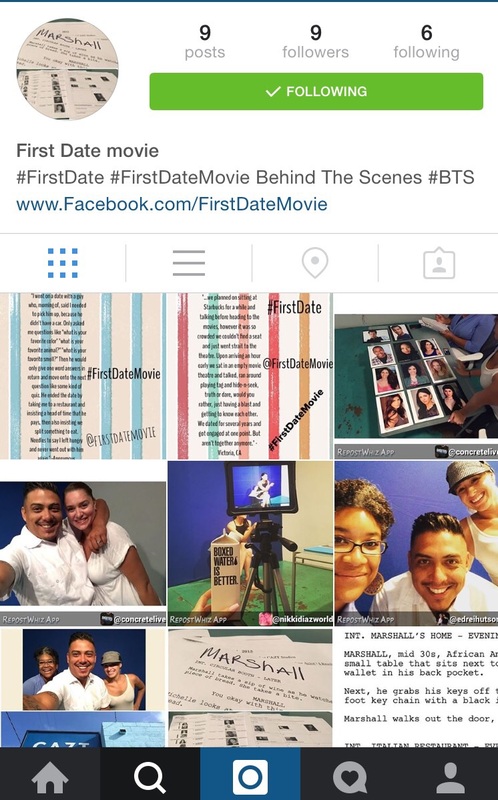 I will be updating the Instagram and Facebook page for First Date Movie for your behind-the-scenes pleasure. I'm always intrigued by the extras included on DVD's and the "making of the movie" bits, so I had to do something for this short. Plus, I'm just a proud wife! I've been in the industry for years, mostly in front of the camera. After experiencing the audition process from behind the camera, I am so enamoured by it. I saw so much talent come through the audition, but at the end there can be only one Michelle and one Marshall. You want them all to get it of course, especially when experiencing the raw talent, but there can be only one. Ouch! Tough decision! Follow the journey to wrap on Instagram @FirstDateMovie, on Facebook www.facebook.com/FirstDateMovie and on my periscope @NikkiDiazWorld. Do you have a first date story you want to share? Email us at FirstDateMovie@gmail.com and we will repost it on our social media accounts, leave name and state or just say anonymous. Sharky's: guilt free Mexican food?